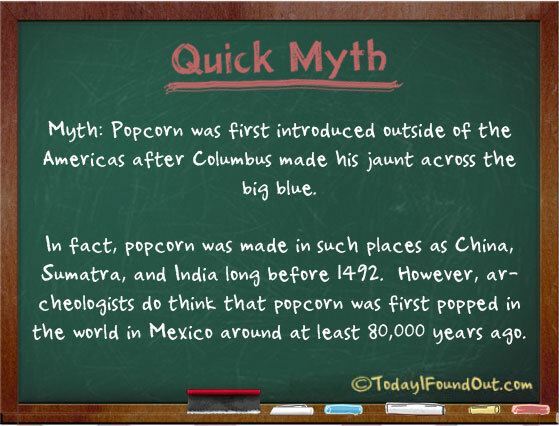 Myth: Popcorn was first introduced outside of the Americas after Columbus made his jaunt across the big blue. In fact, popcorn was made in such places as China, Sumatra, and India long before 1492. However, archeologists do think that popcorn was first popped in Mexico around at least 80,000 years ago. How is popcorn possible in China before 1492 when popcorn is made from corn, which is a New World crop and not native to China. I suspect that a product called corn was popped, but this was not maize related. Corn was a synonym for grain in the English language. Perhaps there was poprice or poprye or popbarley, but it’s hard to believe one could pop a substance that was not available. @Jim: It was actually real popcorn grown in China, Sumatra, and India. At least, if nasa.gov is to believed, which I’m inclined to, as they are usually extremely accurate in my experience.